Written by Kris Baker on November 30, 2012 . Posted in Announcements. Every year, we terrific examples of organizations and individuals giving back – and this year is no different. 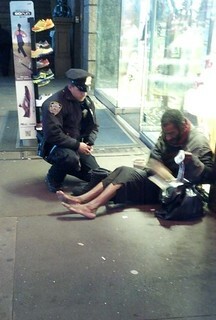 Recently, a New York City police officer donated a pair of boots to a homeless man on the street. The act was photographed by a tourist and has gone viral – the picture has been “liked” over 350,000 times on Facebook. Are you aware of any other acts of kindness this holiday season? Does your organization give back to the community this time of year? Let us know!